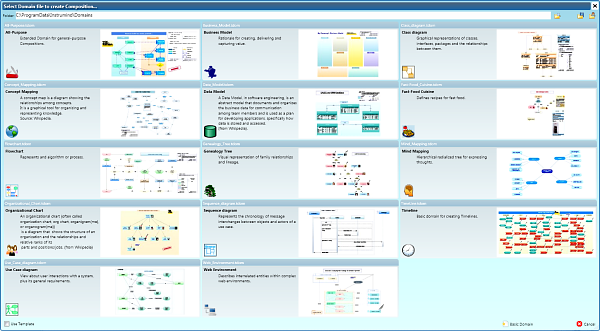 The mind-mapping.org Blog – Page 2 – This blog is about software for visual thinking and organising information. 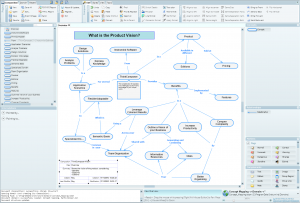 It will give you the low-down on developments in the world of visual networks and all types of business maps. I haven’t tried it, but yes, apparently so. Sébastien Georget recently announced a personal initiative to allow Freeplane users to work together on a map without all the emailing back and forth, and spotting changes to copy to your own map. He calls it Freeplane-collaborative-tools. This is not a web-based mapper like MindMeister, Coggle or MindMup. Instead it is a Freeplane extension using a versioning system. Users work on their own local copies of the mindmap and periodically publish the modifications on a central server from where they can fetch other users contributions. The heavy lifting is done by your choice of versioning system: CVS, SVN or GIT, and this synchronizes the various copies of a map on request. Freeplane is open source, so the source code for Freeplane-collaborative-tools is open as well. There are introductory videos and documents here and they look pretty clear to me. You might ask yourself ‘why not use a free web-based mapper?’ but for expert users of FreePlane, the fact that you can use all the hacks that this software offers to adapt it to your own needs and preferences can be a strong motivation. MindMup is a web-based mind mapper that you can use free, with no limit on the number of maps. It supports multi-user, simultaneous access and, if you’re using MindMup’s free storage or storing maps locally on you computer, it requires no log in. This makes it an attractive tool for school use. That’s not to say that it’s a toy as it can be used for serious mapping. Starting to map with MindMup is easy – their motto of “Zero-friction free online mind mapping” is one that its designers have taken seriously. You might get the impression that MindMup is less capable than it is, because some quite important functions are somewhat hidden, but there are easily-found web pages for help, hints and shortcuts and I’ve mentioned some here. The appearance is quite conventional: Bubbles joined by curved hierarchy lines. There is also an option for straight lines in place of the curves. The strongly-curved hierarchy lines turn out to be a good shape for making best use of space for your map (see the example here, and the ‘Free Movement’ section, below). Relationship lines – the out-of-hierarchy lines connecting nodes in different branches – can only be straight at present. This means they will often cross other lines and pass behind other nodes … not very clean but not too confusing in practice, as their style and color can be changed. There are ample keyboard shortcuts for those who like to build maps as much as possible from the keyboard (count me in). A few of these are a unconventional, but it’s easy to find them from a ‘Hotkeys’ link in the map, and the ‘Help and Hints’ item under the Information button: (i). Oh, and a good user experience to mention: MindMup saves your map in local temporary storage as you work, and once while I was reviewing it, my office power tripped out. It had saved all my work. If you have read my earlier reviews, you’ll know that I like the freedom to move nodes where I want them. I know from forums, groups and social media that there are many other visual thinkers who feel the same way. Some mapping tools, like Coggle, give complete freedom. Some, like Xmind, allow you to move any first level topic around freely and the rest of the branch follows. 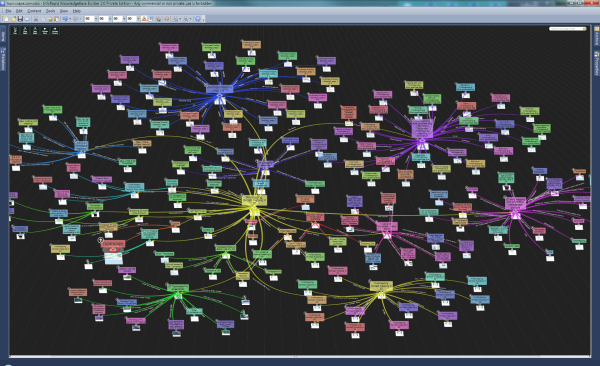 Some, like MindManager, allow you not much more than a choice of the order of branches and on which side of the map a node appears. It’s true that you can move first level topics away from the central topic, but you cannot then tuck a small branch into the space that the move opens up. Complete freedom of node movement can result in partly-crossing branches, and it’s up to the mapper to sort that out. Allowing just first level topic movement helps, but the mapper still sometimes has to intervene to keep branches separate. Accommodating users’ desired node positioning without overlaps is quite a hard problem to solve for the software developer, and MindMup has the best balance between freedom of movement and avoiding messy maps that I can recall in any mapping tool. If you drag topics around, then when released, they snap back where they were. But select a topic, hold down Shift, and drag, and the topic moves to where you place it. As soon as you release, its children follow and any conflicting branches move aside neatly to leave space. You can create spaces and move branches into them. And this is important: You can freely move any node, not just 1st level ones. The generously curved hierarchy lines make it easy to move topics to one side of the map without crossing other lines or topics. You can see this in use, in the example above. How mapping software handles attachments is often important in mapping and MindMup has adequate attachment support for most tasks. Text: Right-click a node, choose ‘Node attachment’ from the context menu, and you will see a panel where you can enter rich text, active hyperlinks and images. When a node has an attachment, a small paper-clip icon appears, and clicking on that opens the attachment panel. Images: It handles images nicely – drag an image and drop it on a node, or right click a node and use an item in the context menu. You can re-scale the image and choose where it appears relative to the text in the node. Alternatively, you can choose ‘Node attachment’ from the context menu, and have the image accessible in the attachment panel, but not directly visible in the map. If you select a node and then drop an image on the canvas (not directly on the node), the image will appear in a node by itself as a child of the selected node. Large images will be scaled automatically to a reasonable size, but you can adjust that scaling immediately. Hyperlinks: There are two ways of including hyperlinks. You can have as many as you like in a node’s attachment panel (as mentioned under ‘Text’ above), or you can include the full URL in the node text. In the second case, MindMup will convert the URL into an active hyperlink, remove the URL from the node text and add a small link icon to the node. A single-click on the icon will open the hyperlink in a new tab of your browser. 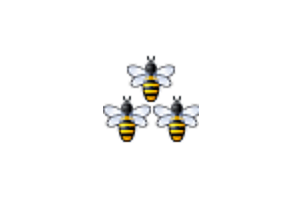 Mindmup also recognizes the links in text attachments and makes them active hyperlinks. Formatting of the map itself is limited. You can choose the color for the background of each node – either from a color picker of 36 colors, or by pressing Shift+space and entering a color name or a web color code like #FFDAEA. But you cannot change the hierarchy line colors (the edges, which are always black), or thicknesses, or specify organic, tapered lines. The node borders are also of fixed thickness, and always black. Nodes are always the same shape. The node text is always black, of the same font and size, and line-breaks for longer text is automatically controlled and not variable. There is a formatting capability that I can’t recall having seen built into mapping software before. In place of the usual icons indicating progress and priority, a sequence of colors can be associated with a status. This is configurable so you can change the colors to suit your own needs, for example, red as ‘urgent’, white as ‘complete’ and so on. A status is inheritable, so if an item at the end of a branch is marked ‘urgent’, then the parent, grandparent, etc. all the way to the central topic are all marked urgent. A problem that I see with this is that the use of color is overloaded. If you color a map, as many people like to, to make colors highlight and separate the branches visually, these colors may conflict with the status colors. The usual icons for progress inhabit a separate layer, so do not cause this problem. Being browser based, it works on Windows, Mac and Ubuntu. I tried it on Windows (Chrome, Firefox and IE 11) and Ubuntu (Firefox). I gave it a spin on an iPad as well, and it can just about be used, but with great difficulty. I’m told a version designed for mobile use is coming, and in today’s world that will be a significant boost to MindMup. For browsers, they recommend Chrome, Safari and Firefox. If you use Internet Explorer it brings up a warning, and this inhibits map sharing. 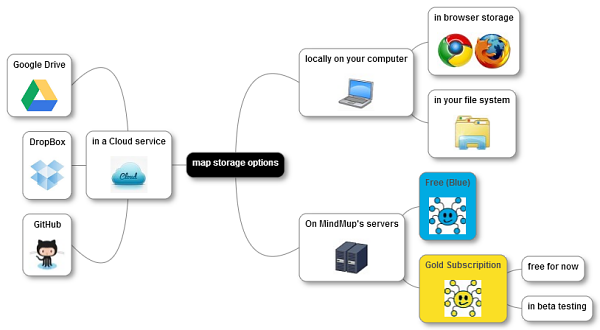 It offers three ways of storing your maps: Locally on your computer, in one of the popular Cloud services and on MindMup’s own servers. You can save maps on MindMup’s servers for free, up to 100KB. This is a reasonable-sized map if there are no images, but adding images can easily take the map over the limit. A subscription service, MindMup Gold allows a total of 1GB, but until the end of the year it is under beta testing, price to be announced. With all the other options for storage, there is only one reason I can see for subscribing to Gold: If you want to embed a MindMup map in a web page. So there is no need to log in, if you are storing your map locally. If you are storing it in one of the supported Cloud services, you will have to log in to that and authorize access to MindMup. If you store in MindMup’s free service, make a note of the URL to ensure that you can find it again. With all other storage methods, you will either log into your cloud service, and find it that way, or with MindMup Gold, you will have loaded a license on your computer and Mindmup will recognize that. 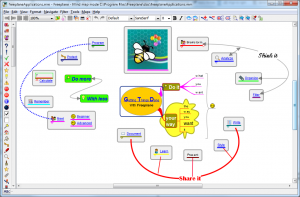 MindMup can import and export FreeMind/Freeplane files (.mm), which is useful as this is common currency among many mind mapping tools. It’s mainly the hierarchical structure that survives the transition either way, as most of the formatting is lost. It can export image files (in .png format), HTML with images and indented text where the background color of text follows node colors, tab-indented plain text, and MindMup files (.mup) to your own machine. 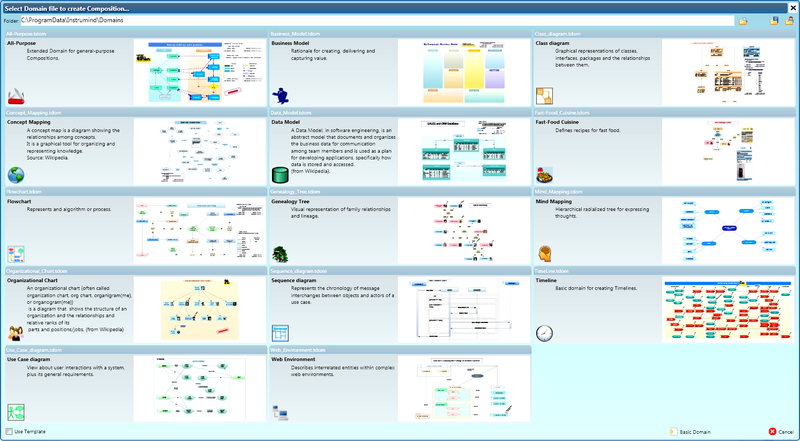 This is a fast-moving subject as new functions are implemented, but in summary the following are not present in MindMup: Searching in a map; built-in icons; drag and drop hyperlinks on topics; floating topics or free text on the map canvas; branch boundaries. Icons can be added as an image, but you’ll have to find the images yourself. Topics can have hyperlinks, but not by drag and drop. There’s more detail about this in a footnote* to this post if these concern you. Although there is no explicit multi-maps function, it is easy to link maps together. As all maps have a URL, hyperlink attachments to a node in one map can link to a second map, and so on. If you are sharing maps using this technique, you will need to keep in mind that all sharers need access rights to linked maps. If you have stored a map on MindMup’s own servers (Free or Gold), you can embed it in a web page. Using the share option (File | Share map | </> Embed this map), you can copy the code MindMup provides. Then paste this into the HTML of the page where you want to display it, and users can view it, zoom in and out, close branches and so on, but not edit it. the fixed width of posts here is relatively narrow and you would see only a very small window into a quite large map. Instead I have embedded it into three stand alone pages to cater for a variety of screen sizes, in case, like me, you don’t like to see mind maps through a tiny window. Small screen, 1024×768. Medium, 1440×900; Large, 1920×1200. Expect a short pause while the page trots off to MindMup’s server to fetch the map. If you look at the code above, you’ll see that “data-width” is set to 90%, and this makes the embedded map adjust its width according to the size of your browser window. Unfortunately, “data-height” is set to a fixed value (500 pixels) and neither percentages nor “auto” work. That’s why I decided to give links to three page sizes, each with an appropriate height to the screen size. This mind mapper is now in the Master List here. Give it a try! You cannot search in a map. Even the browser’s own search box will not find text in topics or attached rich text. There are no symbols, progress proportion icons, smileys, ticks, crosses and so on available as built-in icons. You will need to find your own, drag them in, and possibly resize them as I did in my map. Progress and other topic statuses are indicated by color, and this may conflict with the color scheme you would like to choose to make related topics in a branch immediately visible as grouped together. Hyperlinks cannot be dragged from another browser tab and dropped on a topic. URLs must be keyed in or pasted to a topic’s text. There is no provision for floating topics, free text on the map canvas or a user’s own legend. The built in legend can be made to float on the map but this defines only what colors mean, and does not appear in any exported images. There is no provision for a branch boundary. Connecting edges, node outlines and node text cannot be formatted, as mentioned in the review. FreeMind imports lose text decoration, multi-line node text, line and border colors, images, icons, relationship lines, and attachments. Links and node background color are retained. Multi-line node text becomes a text attachment to an empty node. FreeMind exports lose colors, images, icons, relationship lines, attachments and active hyperlinks. The links are present, but appear as plain text. There is no ‘rubber band’ method (drag round objects with mouse) for selecting multiple nodes. As I say, many of these may be coming. There were several other functions that I missed, and the MindMup developers had implemented them within a day of my mentioning them, so they are responsive and are likely to remain so. Phew! This has been a looong task, working through ThinkComposer, a tool with many blades, compartments, pockets, drawers and attachments. 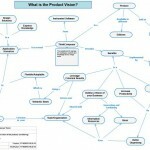 At last, after helpful exchanges with its designer at Instrumind, it’s up on Mind-Mapping.Org. This is an interesting product in many ways. It can produce a wide range of diagram types and visual models immediately after installation, it allows users to specify new diagram types, and it even has the capability to generate code when that is appropriate and specified by the user. 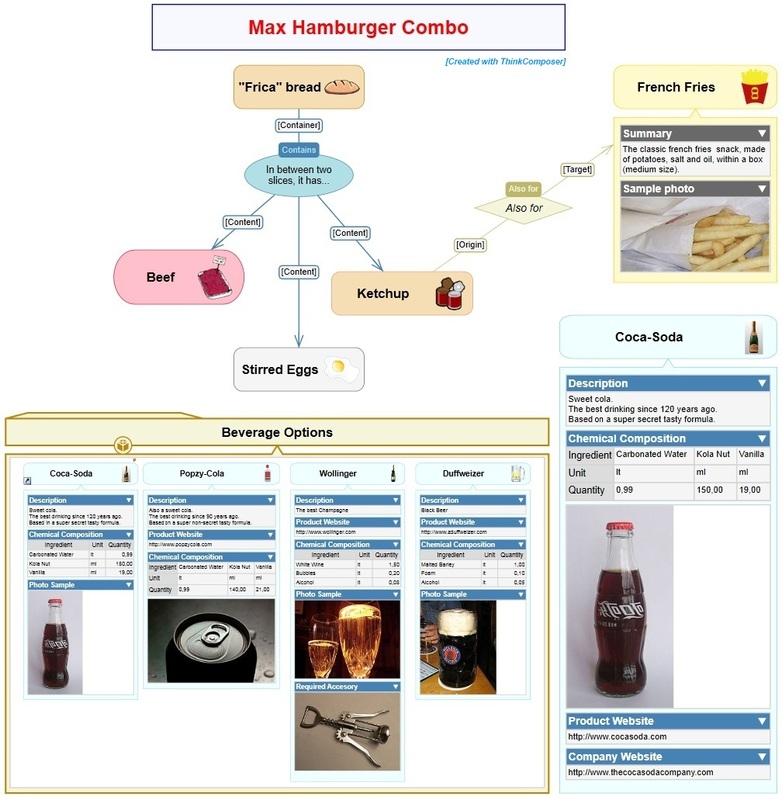 The visual models included with the software are: Business model, class diagram, concept map, data model, fast-food cuisine, flowchart, genealogy tree, mind map, organization chart, sequence diagram, timeline, use-case diagram, web environment and an ‘all-purpose’ diagram. An impressive list. I haven’t tried all of them … I wanted to post this review before Christmas! 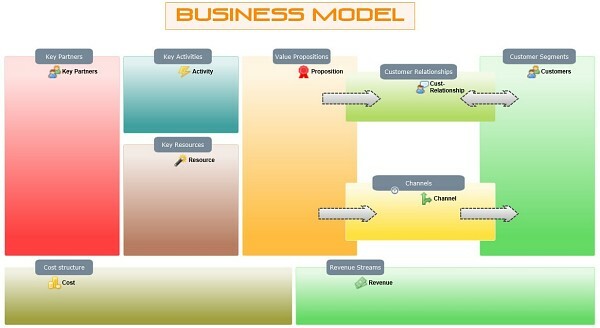 But I have tried the business plan, mind map, flowchart and the concept map. I’ve also included some examples of finished diagrams contained in the installer. Each node (mostly referred to in ThinkComposer as an ‘object’) can contain a whole diagram, allowing users to drill down through multiple levels, or by moving through successive tabs. 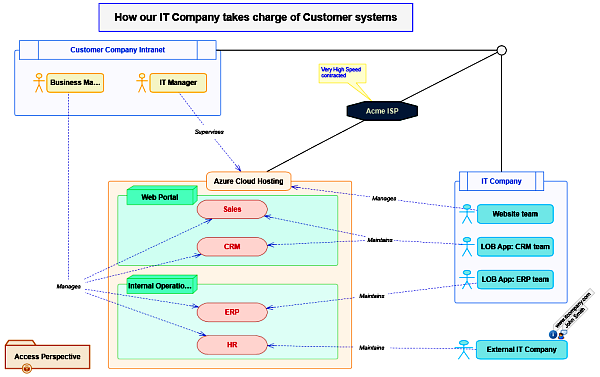 Objects in the diagram can include text, images, attached files, links, custom-fields or tables. At the top, is a ribbon-style set of controls and, though it is not a Microsoft-style ribbon, it is easy to understand. On the left is a linear list of the objects in the diagram, and below it a panel showing, if an object is selected, how that is related to other objects. On the right, is a pallet of objects available, and below it panels of markers and other items that can be added to embelish the diagram. It’s worth keeping an eye an eye on the hints panel near the bottom-right corner of the window. This often indicates controls that are available to you at any one time. When you hover the cursor over an object, icons appear, indicating how the object can be manipulated. Objects have a layer of additional information that can be added, including structured data to record such data as field properties in a data model. These are not constrained and can be defined to suit the user’s needs. It makes this type of business model easily. 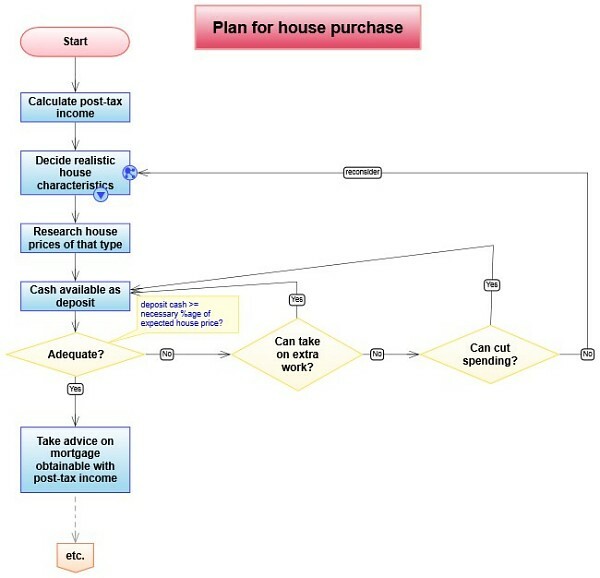 I just took it to the initial stages, but you would go on to fill out the details when planning or analyzing a business. Source: Roy. 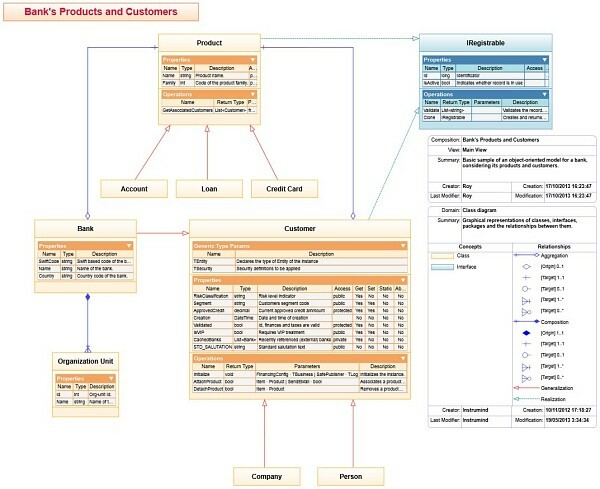 I prefer to use a purpose built UML tool like Visual Paradigm – the one I use for software design – but this looks capable of producing a decent and useful class diagram. Source: ThinkComposer web site. ThinkComposer makes a good job of concept maps, as good as CMAP, the leader in the field. I made a small one myself and found it easy and usable. Here’s a more complex one. Source: ThinkComposer web site. Again, it is capable of making a data model. Being familiar with ERwin, I prefer that, but we all prefer the tools we know and ThinkComposer is workable. 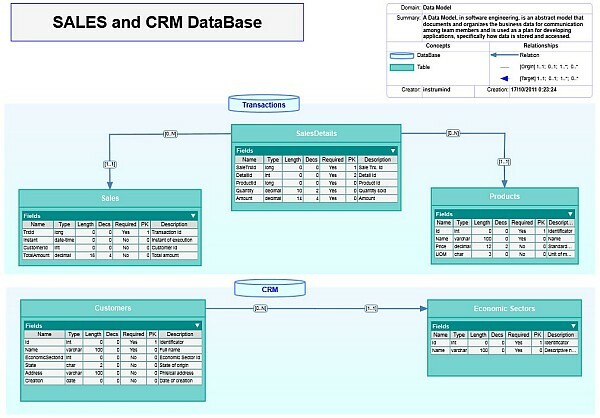 It includes the various cardinality connection types that data models need. Source: ThinkComposer web site. This is a good example of how a specialist diagram can be developed using ThinkComposer for specific purposes that may have no existing visual tool. Source: ThinkComposer web site. Flowcharts are possible without much difficulty, though I found some things I’d like to do – like keeping all lines rectilinear – not so easy as you can see, but this may be down to my inexperience with the many controls. Source: Roy. 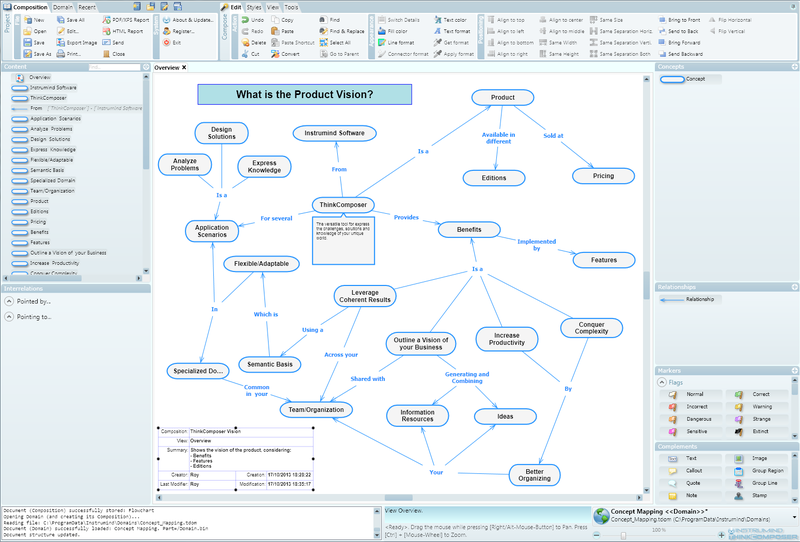 After the smooth experience with ThinkComposer’s concept map it turned out that making a mindmap with this software was something of a struggle. I have reported the issues to the developer, who is working on them. Nevertheless I was able to make the map below. Source: Roy. 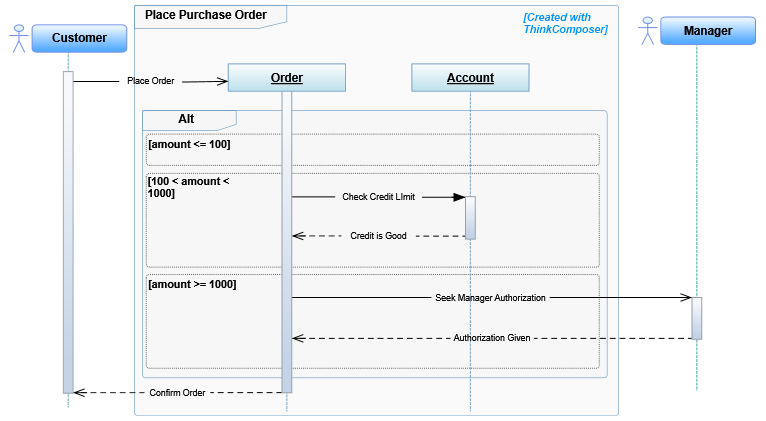 If you don’t have integrated UML software, you could use ThinkComposer to make sequence diagrams. Source: ThinkComposer web site. Being able to build timelines is a handy addition to all the other tools here. Source: ThinkComposer web site. 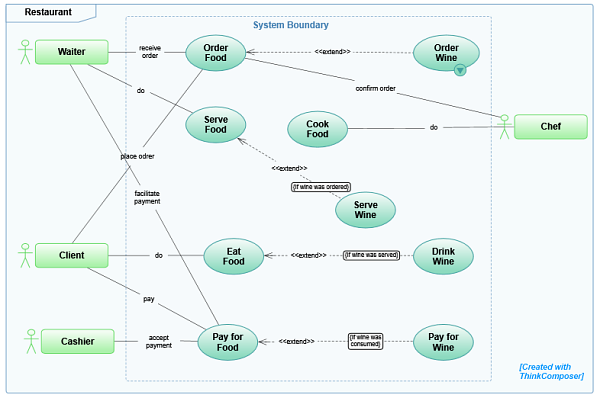 Again integrated UML software is one way of visualizing use cases, but you can use ThinkComposer to make them as well. Source: ThinkComposer web site. So, we’ve looked at all of the built-in diagrams. But ThinkComposer’s designer doesn’t see these as the main motive for using the software. The fact that you can assemble your own diagram elements, describe how they interact and what they contain, means that for many cases where no existing visual tool fits your needs, you can build a Domain from the ground up with the components provided by ThinkComposer. You can use your own template from then on, to work visually in a way that suits you. Some software that helps us produce diagrams can also generate code. 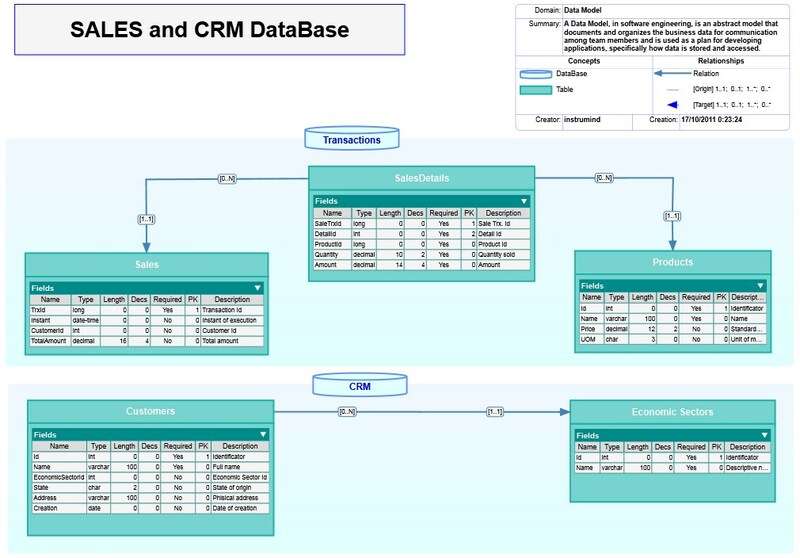 One I’ve mentioned above, ERwin, can generate SQL that will create a database as described in an ERwin data model diagram. Some UML diagrammers can generate program code. But these are specific to a purpose. This is written in a rather abstract style with extensive specialist vocabulary. I suggest that if you just want to use the wide range of diagrams built in, it would be good to start with the User Interface section (p.40 in the current edition of the manual). You will need the other reference material to use the full capabilities of ThinkComposer. ThinkComposer offers HTML output, and this is neat, clear and quick. It can also make a PDF or XPS file from a diagram. This is fast and to an advanced level of detail that you won’t always need, but for technical work is likely to prove useful. This may not be a tool for casual use, but don’t let that put you off trying its many capabilities. It is in active development … a new version was released just as I was finishing this post. The release fixes a few issues that I reported to the developer, who is very responsive. Where to find it, and the various price options are set out in the Master List. A new build of Freeplane was released in late August 2013, and a new release of FreeMind arrived soon after, in early September. Freeplane is a fork of FreeMind – it forked in 2009. I took a brief look at both of the latest versions. Freeplane remains my preferred tool of the two. I find the interface more usable, and I like the fact that the file format does not appear to have changed, and there is a 64-bit version for those running 64-bit Windows. I have many old .mm files and when I try to open them with FreeMind, it tells me it will convert them (with no going back), but then presents a map with a single central topic stating that there’s a parsing error. Freeplane opens the map without problem. The original FreeMind format became an industry standard with many mapping tools being able to import and export .mm files, so it is a shame this change has not been handled with full backward compatibility. One advantage of both FreeMind and Freeplane is that mapping from the keyboard is fast and easy. Good for quick note taking or catching ideas without interupting the flow when brainstorming. I’m working on a review of ThinkComposer. 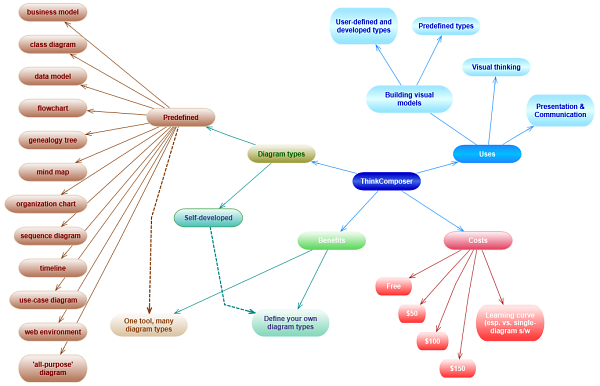 This is a tool with capabilities for making visual models and diagrams of many types and is taking a while to work through. 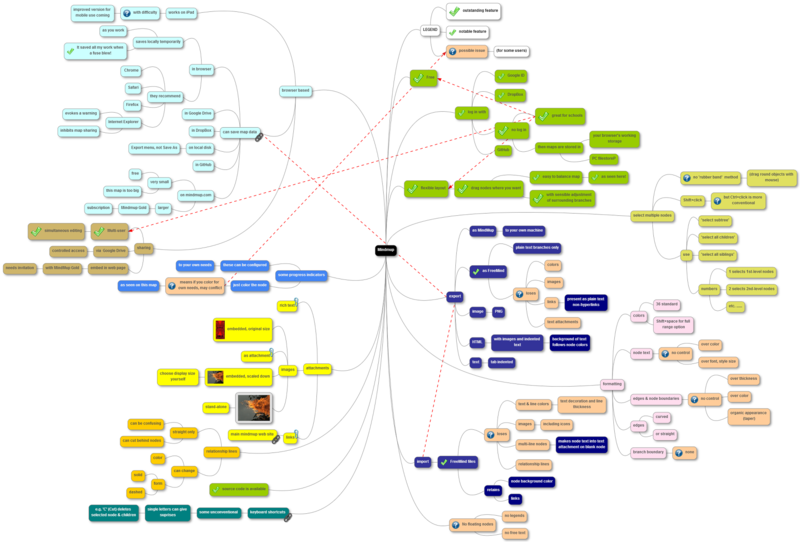 I’ve done some more tidying on Mind-Mapping.Org. Wallace Tait (@visualmapper of visualmapper.org fame) put out a question on Twitter about the fate of one of the earliest tools for mind mapping on a computer: VisiMap. I replied with what the Master List showed and it gave me the idea that I should go through to see which mapping products had turned to dust since Vic last checked. Turns out there are quite a few. After clicking through links to 302 entries that were not marked as ‘historical’, I found that 36 visual thinking tools have gone from the web so I’ve marked them as defunct. And I found 19 that had moved or changed their name so I updated their records. Vic’s approach, which I’m going to run with, was to mark as ‘historical’ any software that was still available (through one of the miriad software download sites, for example) but was no longer supported. Software that was no longer traceable for download or on-line use are marked as ‘historical (defunct)’. These are kept just as a matter of interest, and for the record. By default, both historical types don’t appear in the Master List, but you can elect to have them included by a checkbox in the ‘Refine software list’ tab (top right on Master List pages). And if you search for a product by name, it will show up whether it’s current or historical. I’ll have to check the historical ones to see which have gone defunct, as well. Ah well, another day! Oh, and I also went through WikIT’s list of free mapping software and took out the dead ones. I have many to add as well, but I’m focusing more on the Master List at present. A few posts back, I blogged about InfoRapid Knowledge Portal and I promised I’d soon write about a related product. This builds very similar maps, but has many more functions and is not read-only as ‘Portal’ is. Clicking on one of the small white arrows in the top left corner of each topic node opens a built-in browser window and loads that topic’s web page, if it is connected to one. If you’ve ever tried to produce a mind map of an existing web site you’ll know that it is only easy for the very simplest of sites. 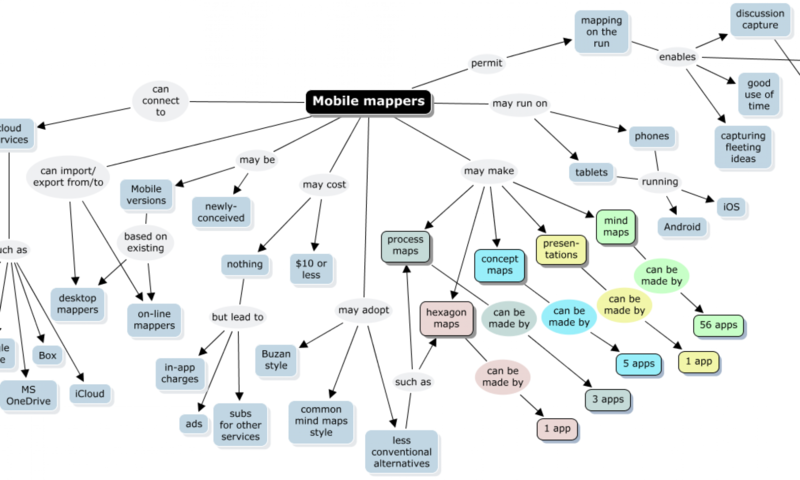 And even for simple sites, concept map topology (see Concept maps or mind maps? the choice) is better than a tree-oriented mind map, because it allows any node to connect to any other node, just as any web page of a site can connect to any other on the site. An example of the kind of problem that turns up is the repetition resulting from navigation, terms and conditions, and privacy notice links on every page. I’ll discuss its ability to crawl* a website later, but first the example above. 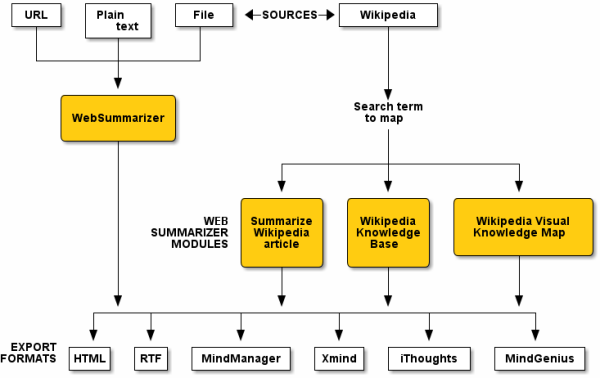 It represents part of WikIT, the mind map wiki. That is built with MediaWiki software that includes a tool to make an XML dump of the wiki database. KB Builder can import this, and you can see (part of) the result. Other data formats that it can import are CSV (Comma-Separated Values), RDF (Resource Description Framework), OWL (Web Ontology Language [A A Milne – geddit? 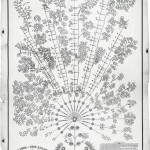 ]), XMI (XML Metadata Interchange), XSD (XML Schema Definition) and GED (Gedcom File for Family Trees). 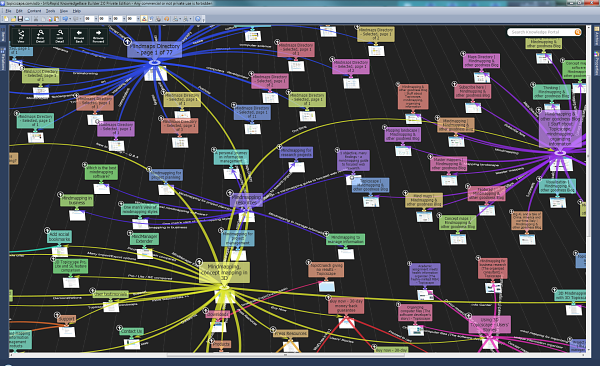 The four panels on each side of the map list the topics, the relationships, properties and an archive. 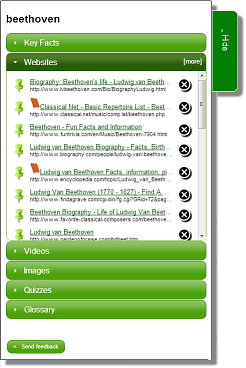 The archive is an intermediate area that allows you to make attachments to topics. The line items in the panels allow the map to be manipulated in a way that Knowledge Portal does not – topics can be removed, added and modified. These panels can be folded into a small tab, if you wish, so that the map can use almost the whole window. I felt that a zoom control was needed, but couldn’t find one on screen or in the menus, but it turned out that if you hold the Ctrl key down, the mouse wheel zooms the map. Then the overall shape of the site became clear with its several centers-of-connection. The Ctrl+mousewheel trick works, because the map part of the window is rendered in a browser – Internet Explorer (it needs IE8 or later). As I said, it’s challenging to produce a graphic sitemap with software, and I find this result impressive and useful. Attempting to show all the connections in a website gets out of hand very quickly for reasons that I mentioned. If you’re doing it manually, you can use your judgement about what to exclude, but it’s more of a challenge with software. KnowledgeBase Builder makes the best fist of this that I’ve seen so far. It can follow and map the links on a website directly or it can import from one of a variety of data file types to build a map. One clue to how it does this so well is a control in the View menu: “Show Cross-Connections”. Allow Builder to map out a good-sized web site, then select Show Cross-Connections. The center of a clear map, may well turn to something like the picture on the right. Plenty of connections are good in a web site, but such repetitions get confusing on a map of the site. When starting to crawl a site, you get to specify number of web pages, number of link levels, links per page, timeout and other controls typical of web-crawling programs. Builder places a thumbnail image of the web page under each node. Click on that, and you’ll be taken to a larger image. This can be useful if the page later disappears and you would like to refer to it. The size of thumbnail and image can also be specified before you initiate crawling. Builder adds a description on each connecting line, derived from the anchor text of the link it followed. So far I’ve talked mostly about Builder making maps automatically from a variety of data sources. You can modify these maps as you wish once they’re made but you can also start with a blank map, as with most mapping software. For each topic that you add manually, you provide a name and can add a description. The name appears on the node, and the description appears when you hover over it. The description is similar to ‘Notes’ attachments in other mapping software, but is more closely integrated because it’s there by default, it is not necessary to click on the topic to see it, and it appears in a pop-up by the node, rather than in a window away from the node. The map adjusts dynamically to an elegant layout as you build it. It also allows you to select any topic to make the central focus: Click a topic and everything rearranges around it, much like 3D Topicscape, Personal Brain or Cayra. In true concept mapping style, you can add descriptive ‘linking phrases’ on relationship lines. You can also select colors, dotted or solid lines, and style of the ends, with or without arrows by selecting a relationship line and amending the items in the Properties pane. You can connect two existing nodes by dragging one onto another in the diagram. If one is not in the visible area of the map, you can click on one of the nodes to be connected (to center it), find the other node to be connected in the Items pane, and drag it to the Relations pane, which at that point will be showing details of the selected, centered node. Files, images and web pages can be attached to nodes. This is the first point at which I found a downside: The steps for doing this are, for example, select a file in Windows Explorer; Copy it (by Ctrl+C, say) … it appears in the ‘Archive’ pane, top right; then drag it from there to the Items pane top left, the Relations pane, bottom left or a node label in the map. Dragging directly from Explorer to the map would be so much easier and more in line with most other mapping software. Making a map from scratch with Builder involves frequent movement between mouse and keyboard – it is not possible to move around the map with the keyboard alone – so this may not be the ideal brainstorming tool for fast idea capture. There is a neat presentation mode, accessed from the view menu or toolbar. This hides the four side panels, and even the small tabs used to re-open them, so that the whole window is used for the map, menu bar and toolbar. A button appears in the toolbar for when you’re ready to revert to the editing view. There is also a free read-only viewer so that people other than the originator of the map can explore it without being able to make changes. Everything I’ve described so far is free for private, (i.e. non-commercial) use. There is a professional version for 99 Euros, and this permits multi-user editing of a map. There is also an Enterprise version allowing for unlimited users within the enterprise and embedding maps on a web site. For this you must request a quote, which I suppose will be based on the company size. I feel this is a tool that has received too little attention and is well worth a look. Here it is in the Master List. * A Web crawler is software that systematically browses the World Wide Web or a specified site, typically for the purpose of Web indexing or downloading a site. A Web crawler starts with a list of URLs to visit. As the crawler visits these URLs, it identifies all the hyperlinks in the page and adds them to the list of URLs to visit. URLs are recursively visited according to parameters that you specify to Builder. This process is also known as spidering. [Adapted from Wikipedia]. The folks at Context Discovery have long been developing products that use their Summarizer engine to analyze text syntactically, pull out keywords and present related sentences under each keyword. Their different products vary by source and output form. Three of these are the latest addition to Mind-Mapping.Org, and the last in the series I’ve been doing on products that use mind maps to deliver fixed content derived from analysis of web pages or other documents. The output of Context Discovery products can be text oriented, a word cloud or laid out graphically as mind maps. 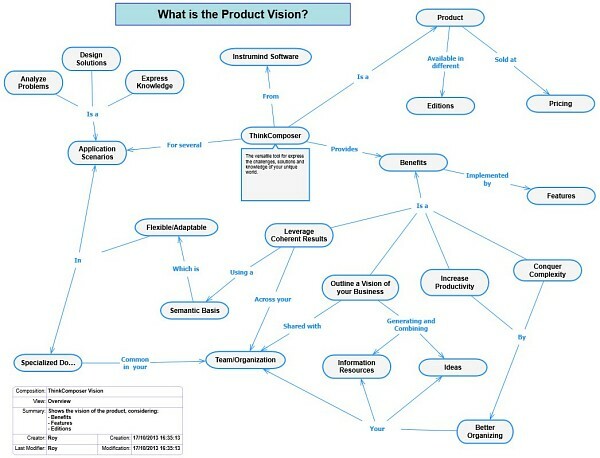 I’m reviewing just the product variations that make mapped presentations because the others fall outside the scope of Mind-Mapping.Org. So for input, you can have a web page URL, a block of your own text that you paste in, a file (PDF, Word, TXT and others) and a chosen topic from Wikipedia. 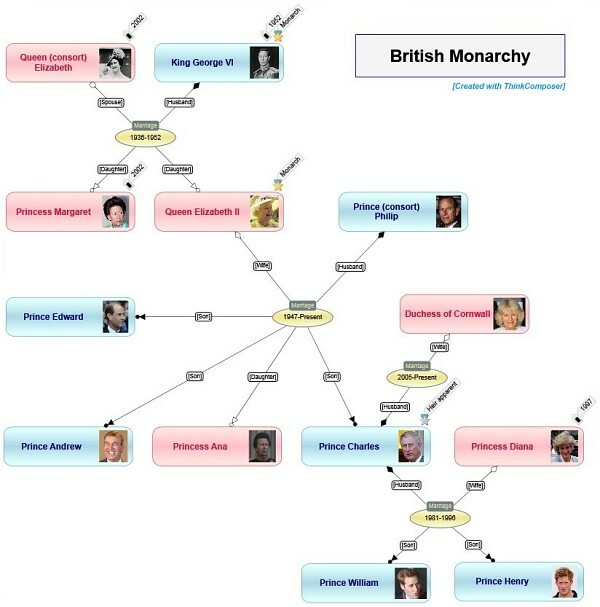 The example map shown earlier was from the Wikipedia Visual Knowledge Map module. This draws on a database of 3 million summarized Wikipedia pages. The other two Wikipedia modules let you see a summaries map focused on a single Wikipedia page for your chosen topic – Summarize Wikipedia article – or a map to show summaries from the most relevant Wikipedia articles related to your topic – Wikipedia Knowledge Base. The second product with mapped output is XmindSummarizer – an add-in for Xmind. This is actually produced by a partner organization of Context Discovery, specializing in Xmind add-ons. With this, you select a topic in an Xmind mind map, and click on the ‘Summarize by topic’ button. Then it will either map the keywords determined from the Wikipedia entry if there is one, or if the topic includes a full URL, it will visit that page and summarize that by keywords. Summaries can be created from web pages in English, German, French and Spanish with the language being detected automatically. There are hints that the languages covered may be extended to Japanese, Korean and Chinese. Within Xmind, under Edit > Preferences there is a new entry: Smart Extensions > Summarizer that sets out the customization options. The most important of these is to specify the language for word definitions from Wikipedia. At present you can choose from the same four mentioned above. My experience suggests that XmindSummarizer is product that has not yet reached maturity. For example, ‘Undo’ does not work; and I have used this with about ten topics, of which two failed to produce results. The first caused a hang but was fixed when I reported it and now works. I just found and reported the second, for the topic ‘Water’ which produced no results. WebSummarizer pulls in a comprehensive summary for ‘Water’ as you can see from the example at the beginning of this post. As both draw on the same Wikipedia database, I was surprised that ‘Water’ came up blank in XmindSummarizer. There is another product: Context Organizer Personal, but I understand this to be a legacy product for the desktop. For this, you choose at installation time whether to configure the Web, Office or MindManager option. Only the last of these produces graphic output and this option only works up to MindManager v.9 and it is being phased out, though still supported for existing users. I’ll pass over this, but felt it was worth letting you know where it fits in Context Discovery’s product list. You need to try these to see if they fit your needs. Myself, I find that I get more out of the task of reading a document and mapping it out, than I do when passing it to software to do the job for me. You may get a different result. You can try WebSummarizer on a 14-day free trial basis or go to the demo pages to try fixed topics. There’s a more about these in the Master List here (WS), here (XS) and here (CO). * In case anyone asks about the tool I used to make the inputs and outputs diagram, I’ll anticipate the question: It was made with ASCiiFLOW and Ditaa – I came across Vic’s review of these while browsing his old posts, and thought this would be a good opportunity to use it for real. 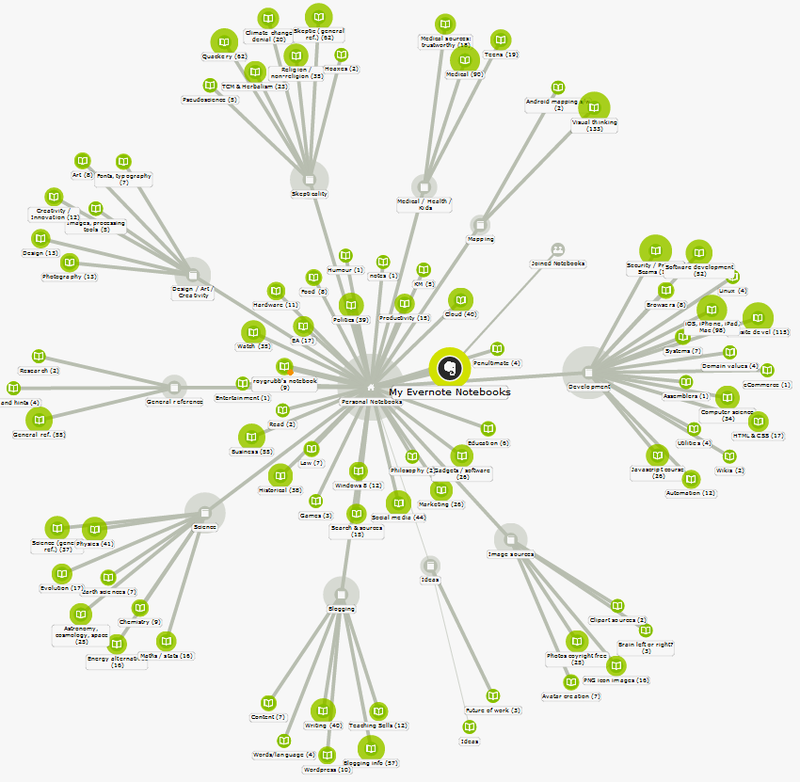 Next in the series of posts about visual content delivery tools reviews Mohiomap. 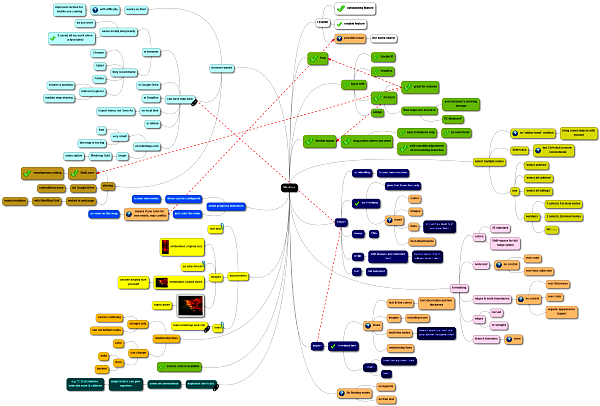 I have just added that to Mind-Mapping.Org. If you use Evernote, I think you’ll like this. It can take your on-line Evernote database and quickly build a mind map of the notebooks, reflecting the way you’ve organized them. Then you can penetrate to the individual items. Myself, I’m frustrated that Evernote doggedly sticks to the two-level folders way of organizing notebooks. Until that improves, I guess many mind mappers will be similarly frustrated. 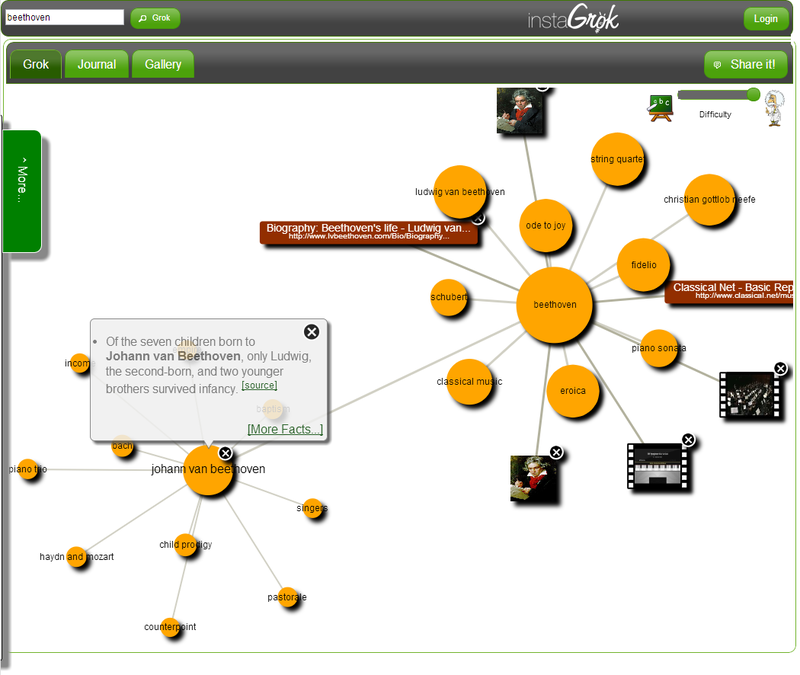 But at least Mohiomap can take the structure of the notebooks within notebooks and set it out visually in a map. This is another force-directed map where you can drag nodes around and it will adjust, but it allows you to pin nodes in place to take control of the layout. Using an option that appears when you hover the cursor over a node, you can choose to explode the node to see the individual notes contained in the notebook it represents. Again these are mapped, this time against nodes indicating the month when you saved the item. For individual notes, you can preview them down the left side of the screen, or open the link in a new browser window. 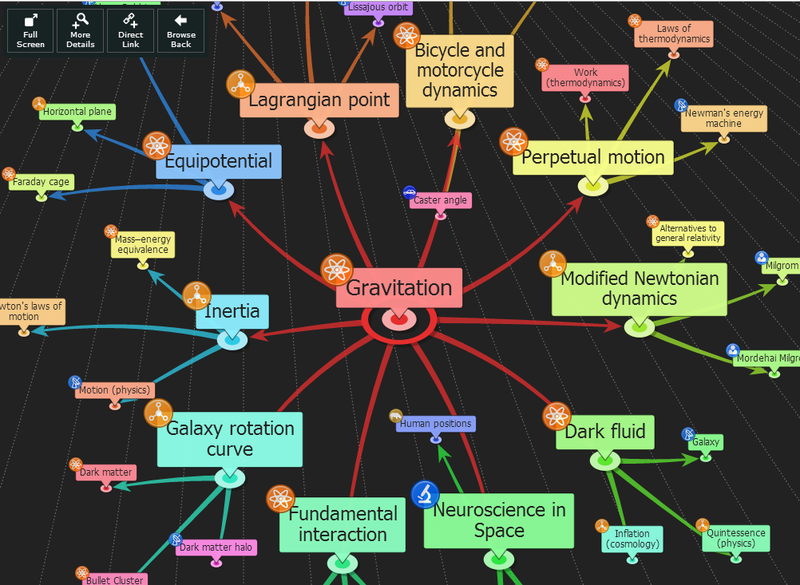 There’s an on-screen zoom control – the mouse wheel does this as well – and a control to center the map on a chosen topic (notebook), and expand it to show its notes, with or without related topics showing. There’s also a control to filter by age of note – you can filter out the old topics, if looking for something you added recently, say. If you keep confidential material in Evernote (and I wouldn’t – it’s in the Cloud and not encrypted with a password known only to you), you wouldn’t want to give Mohiomap access to your Evernote database. But if like me you use it as a place to keep odds and ends you’ve found on the Web, this won’t be a problem. Mohiomap does not work in Internet Explorer 8 or earlier. This is an attractive and practical way of navigating your Evernote database . . . visually. See it here in the Master List. 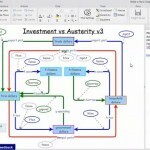 Continuing on the theme of visual content delivery tools from my previous post, I have just added Instagrok and Graph Words to Mind-Mapping.Org. This is a browser-based tool for exploring subjects visually, with information culled from right across the web. 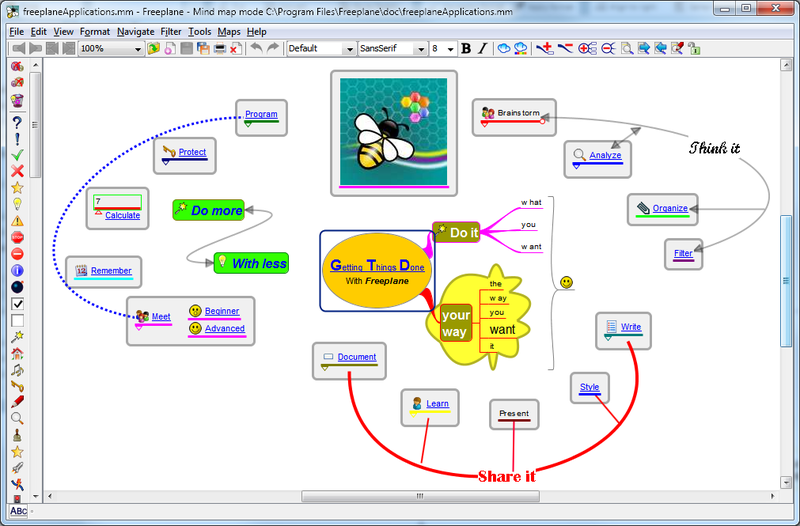 It presents a visual breakdown of the chosen topic in a bubble diagram and includes small images and video icons that when clicked, enlarge and where appropriate, play. Hovering over each bubble displays text from the source (and a direct link to the source). On the left of the window, is a tab marked “More…” – click on that and you’ll find a trove of additional material related to the chosen topic: Key facts, web sites, videos, images, quizzes and a glossary. The bubble diagram is force-directed, so you can drag the bubbles around at it will and it adjusts accordingly. Click on a bubble and the map is re-centered around that node. Click on an image and it enlarges and gives details – similarly for a video, which will play. Instagrok draws its information from multiple sources – Wikipedia, as you would expect, but many others like Answers.com, YouTube, Britannica.com, BusinessInsider, Foursquare and many more. Importantly, it lists its sources for each item displayed. Intriguingly, there is a 3-position ‘Difficulty slider’ which adjusts material presented according to the depth of knowledge required to understand it. This is a free web service, with Amazon advertisements down the right-hand side, or for use without adverts, you can pay US$35 p.a. This web service is an interesting contrast with InfoRapid Knowledge Portal, covered in my previous post. That, in my opinion makes much more attractive, usable and appealing maps but is limited to delivering whatever it can find in Wikipedia. That is a substantial source, if used carefully and backed up with an examination of primary sources, but InstaGrok draws on a far greater universe of reference. Here is its entry in the Master List. 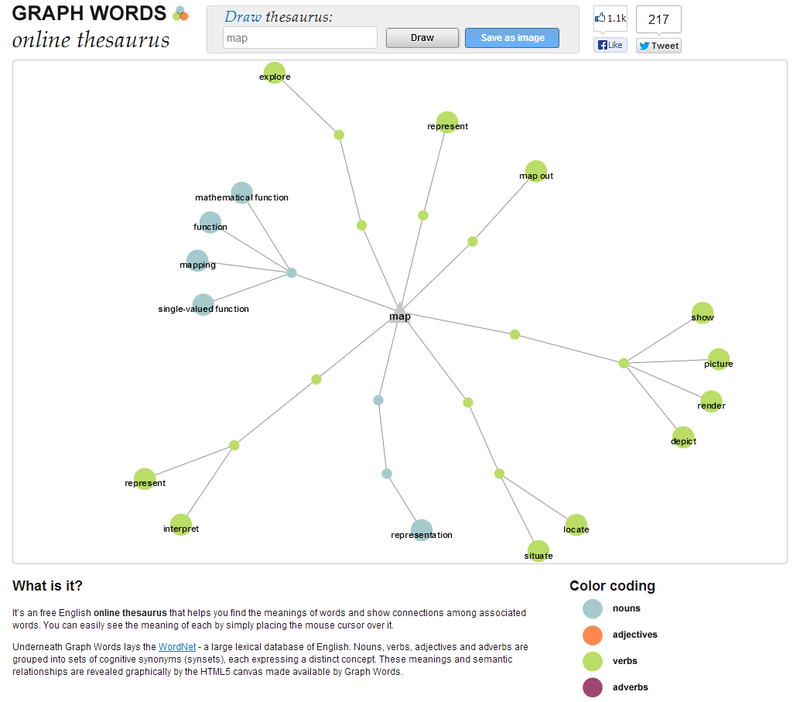 Graph Words is an online word mapper, similar to VisuWords and VisualThesaurus, and like those, it runs in your browser: Type a word into the “Draw thesaurus” box at the top of the page, and you’ll see connected words from WordNet, a free and publicly available database of English words from Princeton University. Here’s one for the word ‘map’. When you hover the cursor over one of the small dots, Graph Words provides a definition. I find that VisuWords gives more comprehensive and useful results. But if you need a thesaurus and like mapped-out results, it’s good to have a second tool to fall back on when one doesn’t provide the word you’re looking for. Because VisualThesaurus is not free once you’ve exhausted the short trial period, and the results it gives almost match those from Graph Words, there seems no reason not to use the free one. See more detail here in the Master List. There is a certain class of visual thinking product that takes some textual content that’s on the web, and organizes it as a map, and it’s these we’ll look at today and over the next few posts. These are categorized as ‘visual content delivery’ in the Master List. 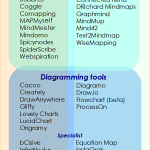 I’ll start with two examples that have appeared in the blog before so you’ll know what I have in mind: WikiMindMap and VisuWords. 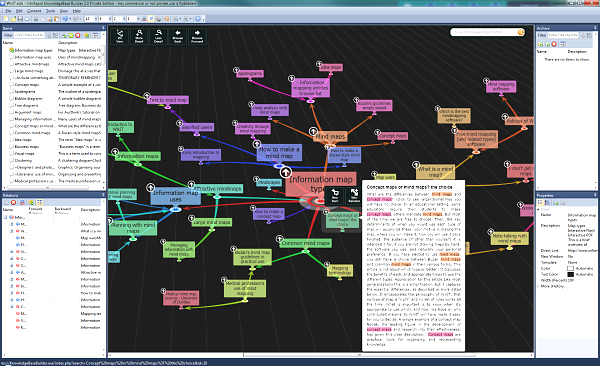 WikiMindMap takes a Wikipedia page (in any of 13 languages) and builds a mind map from it. Vic first blogged about this in 2007, but it’s still up and running and can be useful, especially as you can download a FreeMind file of the map it produces and take it on from there. VisuWords takes an English word that you specify and, using its own internal dictionary, maps out associated words and how they are connected. Vic wrote about that in 2008. I’m adding seven of these visual content delivery tools to Mind-Mapping.Org and will be blogging about them in the next few posts. InfoRapid Knowledge Portal is the first. 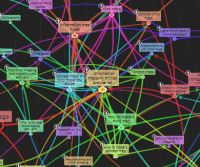 This pulls information from Wikipedia and presents it in a visually-appealing way, as well as giving extensive textual and image backup to the topics it maps. It also provides links to related images from Google. This is a free-to-use, online tool. 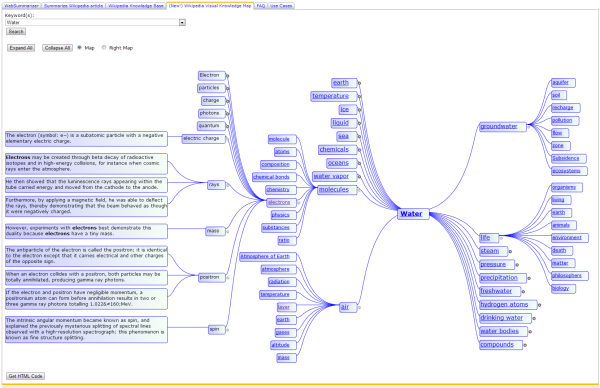 As well as the mind map, Knowledge Portal pulls in supporting text. That often greatly exceeds the space taken by the map, as the example on the right shows. As you can probably guess from that image even though the text is too small to read, keywords appearing in the map are highlighted in the same color in the text. 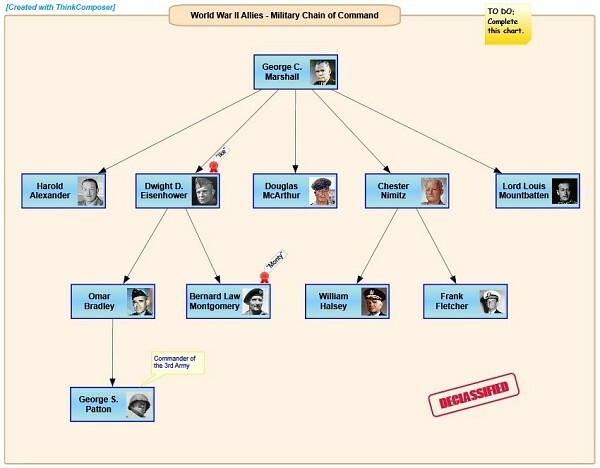 Unlike WikiMindMap, you cannot download the map produced to develop it further yourself. You can make your own maps of this type, and they can be based on text you choose or provide, instead of Wikipedia, but that needs a related product: InfoRapid KnowledgeBase Builder 2.0, and I’ll be writing about that in a later post. Get more of the details about InfoRapid Knowledge Portal from its entry in the Master List.